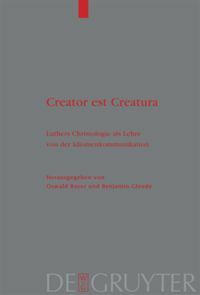 Creator est Creatura: Luthers Christologie als Lehre von der Idiomenkommunikation,ed. Oswald Bayer and Benjamin Gleede (Berlin: Walter de Gruyter, 2007), xiii + 323 pp., hb € 99.95 / $ 150.00. The six essays contained in this volume collectively offer a picture of Martin Luther’s Christology that takes issue with its customary presentation as a diachronic series of contingent responses to crises and controversies. Luther’s Christological thought did, to be sure, become more self-aware and more precise, as he was compelled to respond to various challenges. But as these essays so admirably demonstrate, underlying Luther’s variegated Christological reflection was a fundamental and uncompromised insistence on the concreteness of the exchange of properties between Christ’s two natures. As Luther saw it, only when taken as concrete – that is, as reciprocally holding nothing back – can the togetherness of the natures in Christ’s person give adequate expression to his identity as Saviour, who as a person is never, not even conceptually, to be separated from his work. Contrary to what the volume’s title might indicate, the essays do not restrict themselves to an analysis of Luther’s Christology. They also situate the reformer’s particular interpretation of the communicatio idiomatum more broadly within the Lutheran tradition. And, moving even further afield, they seek to uncover this interpretation’s forerunners in the early church, as well as proposing that Luther’s insights constitute a viable, though neglected, alternative to the speculative or overpsychologized modern depictions of Christ. The opening essay, ‘The Word Became Flesh: Luther’s Christology as Doctrine of the Communication of Properties’ by Oswald Bayer, introduces the central themes of the entire volume. It situates the project of recovering Luther’s Christological metaphysic against the backdrop of the early-twentieth-century Luther Renaissance, which severed the reformer’s theology of the cross from the underlying ontology and then distilled this theologia crucis into an abstract epistemological principle. Against this one-sided depiction, Bayer presents Luther as a theologian firmly rooted in Chalcedonian dogma. What Luther inherited from Chalcedon were two emphases: (1) in Christ God is not impassible, and (2) in Christ there takes place not some monophysite fusion but a union of the two natures, a union that is very much concrete in its hypostatic actuality. Because Luther never lost sight of the soteriological intent of these two points, his Christology, according to Bayer, was a genuine breakthrough vis-à-vis the scholastic tradition, which saw any exchange between the natures as largely a matter of verbal predication and reciprocal application of names. Luther’s fundamental insight was that, in light of God’s philanthropic act in Jesus Christ, humanity and divinity could no longer be treated as essences abstractly predetermined and immovably fixed in their incompatibility. This led Luther to question Thomas’ philosophical denial of the natures’ reciprocal participation in each other, as well as Ockham’s axiom that there exists no proportion between the infinite and the finite. Likewise, Luther rejected any notion of a supposital union, whereby the hypostasis of the Son, as such, remains unaffected by the assumption of the human nature, which is reduced to a merely instrumental role. But the implications were even further reaching. Christ’s theanthropic actuality called for a revolution in language. There could now be no uniform concept of (logical) truth that would apply both to theology and philosophy. In short, Luther did not allow semantic logic to function as a straightjacket for capturing the event of God’s becoming flesh; it was rather the actuality of Christ as God and man that determined the content of these latter concepts, their interrelation, as well as the meaning of salvation. As Luther made the communicatio into the center of salvation-focused Christological dogma, the actuality of the exchange became the impetus for the happy exchange between Christ and the sinner. Benjamin Gleede’s essay, ‘Mixed, exchanged and reciprocally attributed: On the Changing History of Christ’s Properties in the Ancient Church’, seeks to accomplish three major purposes. First, it offers a survey of the Christological controversies of the late fourth and early fifth centuries with a view to discovering when the distinction between concrete terms (man, God) and abstract terms (humanity, divinity) arose and what role it played in those controversies. This meticulous pursuit actually takes Gleede as far back as Tertullian and Origen. Second, Gleede traces the post-Chalcedonian conceptual development of what had by then finally become known as the ‘communication of properties’. The final problem that the essay takes up is the question of the extent to which Luther’s reduction of the early church’s Christological commitments to the distinction between concrete and abstract terms (which underlies the communication of properties) gives faithful expression to those commitments. The following essay, ‘Christ is made sin for us metaphorically’, by Anna Vind, owes its title to Luther’s 1521 polemical treatise against the Louvain theologian Latomus. Vind offers a discussion of Luther’s use of rhetorical figures. She then tries to situate the reformer’s approach in a broader perspective by comparing and contrasting it with Quintilian’s theory of rhetoric and metaphorical language. For Luther, Vind argues, metaphorical language, with its capacity to assign new meanings, offers a way of escaping the confines of semantic logic and achieving more clarity of expression. Luther’s break with the ancient rhetorical principles comes when he rejects that similarity be the basis of metaphor and when he claims that metaphor involves not merely verbal transfer but an actual translatio rerum. This makes metaphorical speech closer to reality than non-metaphorical speech, crippled as the latter is by its internal logic. It also makes metaphorical language the prerogative of God, who through his Word speaks (new and unexpected) reality into being: God became a human being, more than that, sin for us. Theological language is metaphorical language par excellence. In his brief essay Gottfried Seebaß offers a useful discussion of the development of Luther’s Christological thought culminating in the Disputation on the Divinity and Humanity of Christ (1540/43). He emphasizes the role that the communication of properties between Christ’s natures plays in Luther’s early dismissal of eucharistic transubstantiation. Seebaß then shows how the same concern about the preservation of the natures’ concrete communication animates Luther’s polemic against Karlstadt and Zwingli, eventually leading the reformer to a vehement dismissal of the Christologies of Melchior Hoffman and Caspar von Schwenckfeld. Even though Luther’s Christology, on account of its emphasis on the actuality of the communicatio, is frequently charged with monophysitism, Seebaß shows it was rather Hoffman and Schwenckfeld who were the true monophysites. Hoffman believed that Christ’s body actually had its origin in heaven and not from Mary; Schwenckweld taught the eventual absorption of Christ’s body into his divinity. By affirming the communication, Luther meant to underscore that the natures remain two natures, much as they may be influenced by each other in the actuality of the person. In the only English-language essay of the volume, which offers a close reading of Luther’s Disputatio de divinitate and humanitate Christi, Paul R. Hinlicky tackles the problem of Luther’s alleged Docetism. (The translated theses of the disputation, which was mysteriously left out of the American edition of Luther’s Works, are appended.) As Hinlicky puts it, ‘One gets the impression that by Docetism interpreters question whether Christology offers a plausible or realistic construction of the human consciousness of Jesus, a view going back through Schleiermacher to the Antiochene school of the ancient church. But this will be something quite distinct, both historically and theologically, form the denial ‘that Jesus Christ has come in the flesh’ (1 John 4:2) which the Apostolic Father Ignatius of Antioch first identified as the deviant teaching of “docetism”’ (pp. 142-3). In the course of his analysis, Hinlicky, too, emphasizes the ontological character of the communicatio and the phenomenon of a “new language” that arises in consequence of the Incarnation. Of particular interest is Hinlicky’s analytical identification of two circles, hermeneutical and theological, operative in the disputation. These circles, he argues, reveal Luther’s privileging of the communicatio to be not an arbitrary step but rather a decision fully consonant with the catholic faith (to which Luther explicitly appeals) and the salvific nature of the Christ event. The final essay by Jörg Baur takes up over one third of the entire volume. It presents both a historical overview and a careful theological analysis of one of the most difficult implications of Luther’s axiom, ‘where you can say: Here is God, there you must also say: Christ the man is here also’, – namely, the ‘ubiquity’ of Christ’s body. Baur’s staggeringly rich discussion ranges from the Nominalist tools that allowed Luther to conceptualize Christ’s body as participating in the divine omnipresence to the problems that Luther’s seventeenth-century successors were still facing when trying to account for the difference between Christ’s states of humiliation and exaltation. In this essay Baur clearly sides with Luther and the gnesio-Lutheran party. He criticizes Philip Melanchthon (as well as Martin Chemnitz) for compromising Luther’s Christological contribution by re-introducing a supposital understanding of the personal union, reducing the exchange of properties to verbal predication, and treating both divinity and humanity as ontologically fixed categories, thereby losing sight of the salvific impetus of Luther’s theology. This is not to say that Baur is not also critical of Johannes Brenz and others who strove to carry on Luther’s mantle. According to Baur, Brenz fails precisely at a point when, in an effort to conceptualize the omnipresence of Christ’s majestic body, he denies that heaven is, in any sense, a place and, in so doing, denies to this body any capacity for locality. Both the faithful successors of Luther and those who strove to correct some of his most ‘offensive’ theological doctrines, Baur concludes, compromised his salvific emphasis in the name of the philosophical coherence of their systems. If there is any criticism to be made of the entire volume, it is twofold. The analysis would be even richer if the essayists had been able to engage each other. A foretaste of that is offered by Hinlicky’s Trinitarian polemic with Baur’s critique of Chemnitz. Also, intriguing is Bayer’s claim that Luther’s salvific-Christological conceptualization of the togetherness of the infinite and the finite constitutes an attractive alternative to the mere scholastic compounding of incommunicative elements or to a philosophical synthesis, whether speculative (Hegel) or existential-psychological (Schleiermacher). A more explicit systematic-theological exploration of the importance (for our day) of retrieving Luther’s Christological insights would have been in place. But these criticisms by no means detract from the analytical and historical contribution that this volume makes. All in all, Creator est Creatura presents a splendidly co-ordinated collection of essays that deal with the much neglected ontological foundation of Luther’s Christology. Together the essays richly illuminate the reformer’s privileging of the communicatio idiomatum by exploring its metaphysical, soteriological, and linguistic implications, as well as by discussing its forerunners and its reception. Great to hear about this volume. Thanks for posting your review. Just a question for you on this subject, since you’re the newest Luther expert… Have you ever looked at W. Elert’s “Der Ausgang der altkirchlichen Christologie”? By the way, what on earth gave you the idea that I should be the next Luther expert? I think my goals are far more modest :) Besides, my dissertation work is on Juengel. Especially in his treatment of the Greek fathers and the Nicene era Christology, Elert lays out in his “Der Ausgang der altkirchlichen Christologie” work (which took him 10 years to complete) many of the same points as listed above in this 2 volume set, and espouses a very real Theopascism which arguably the mature Luther does as well (see his Disputation on the Divinity and Humanity of Christ) since he espouse a mutually reciprocal, “2-way” communio naturarum in which the Divinity takes upon itself the idiomatum of the humanity as much as the Humanity does of the Divinity (and Andreae espoused such a theopascism too, much to the chagrin of Selnecker who complained to the Elector about it during that time of the making of the Formula for Concord.) Granted, with the exception of some that Elert found in history (such as the Monophysite Philoxenus of Mabbug), Luther is unprecedented in asserting such. On Christology, it is arguable whether or not Chemnitz really is the “Second Martin”, to me he is the “Second Phillip” on the Christological aspect at least. Also, the soteriological influence on Greek Christology needs to be noted–the Impassibility of God is crucial for their theory of “theosis”–I mean, if God moves and is not fixed at a point (via these supposed Platonistic Divine Attributes), then you’ll never be able to attain through ascent to that point where one can grab whatever one can of the Divinity (whether you are pre-Palamite or Palamtie “energies” of God type)…But I rant.. Thank you for your very informative comment. I was actually quite surprised that none of the contributors to “Creator est Creatura” as much as refered to Elert. It is interesting to note that although it is some monophysites that could be seen as Luther’s distant ancestors, Luther’s integration of Christological ontology and soteriology (based as the latter is on exchange and communication) actually presupposes affirmation of Chalcedon’s definitio fidei. But, of course, Luther went further than that. Robert Jenson credits Luther with being the first Western theologian to work out the full Christological implications of the Chalcedonian definition. Though the council carefully distinguished between hypostasis and natures, it failed, according to Jenson, to determine what sort of ontological category ‘hypostasis’ was. In light of what Chalcedon says about the natures, one may, in fact, conclude that ‘the “one hypostasis” is nothing actual, and that the natures’ union has no material consequences for the state or activity of either nature’. It was Luther who, in defiance of this Western apprehension, insisted that the hypostasis of the God-man is not merely, or practically, notional in character but is rather the real and only agent, the sole and active locus of the natures’ actualization.